Electoral Relay Race: Is Incumbency Advantage Transferable? The local MP is stepping down after a mere 19 years, and the local mayor wants his job. The outgoing MP won his seat five times in a row on a plurality of the Erststimmen. Structural factors aside, this looks like an incumbency advantage (though the 2009 result was rather close). Can he pass this on to the successor? In the 2010 UK General Election, party incumbency (as opposed to personal incumbency) did not make a difference for new candidates. 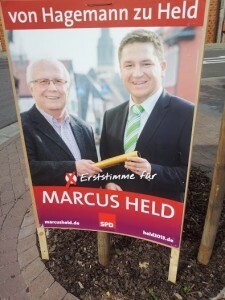 I’m not sure if it will play in the 2013 election over here, but I doubt that this poster will help.